In this Chinese Soup,I use fresh Chicken Soup for stock(done with 100 gm Chicken pieces with 1/2 tsp salt , 1/2 tsp turmeric powder and 1100ml water)and shredd the chicken pieces left inside to be added to the soup later. Heat olive oil and butter in a saucepan,add the chopped garlic,chopped ginger and onion pieces.Saute this till onion becomes tender. Add the grated carrot,grated cabbage,boiled and shredded chicken strips.Add Soy sauce and chilli sauce and stir-fry until it changes color. Add the powdered pepper corns,half spring onions,chopped celery,chopped lemon grass,chopped capsicum and saute for 2-3 mins. Add the chicken stock(or soup) and bring to the boil and simmer for 10 mins. Add the fish sauce,salt and sugar.Mix well for 1 min. Add corn flour mixture and stir until it turns thick. Add the chopped spring onion and the remaining chopped coriander leaves. Add the lemon juice,mix well and turn off the flame. 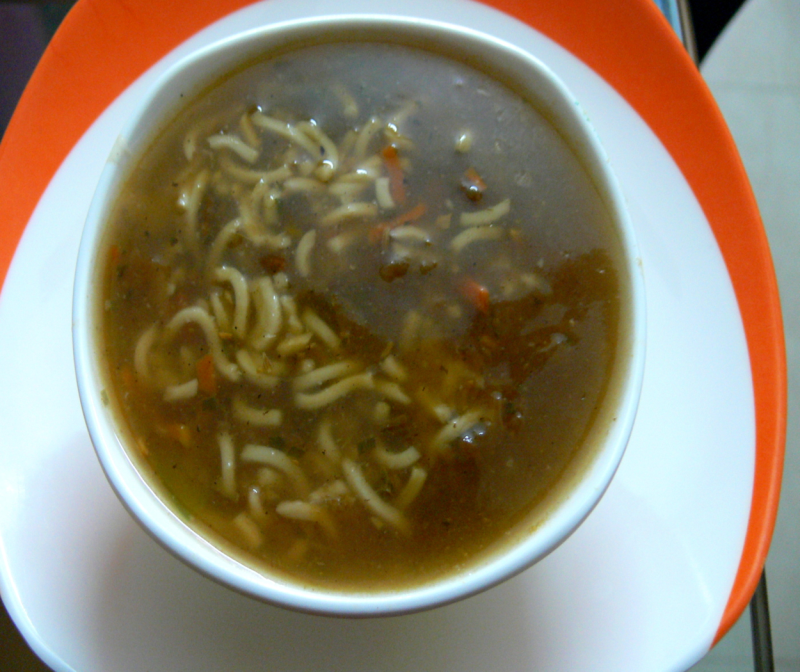 Serve this Hot and Sour Chicken Noodles Soup with Herbed Croutons.